Significance : Dedicated to Infant Jesus; contains the mortal remains of St. Francis Xavier, patron saint of Goa. Festivals : Feast of St. Francis Xavier, on December 3 every year; exposition of St. Francis Xavier's body, held once in every ten years. The town of Old Goa has some of Goa's most prominent churches and the Basilica of Bom Jesus church stands out for its magnificent Baroque architecture and sacred legacy. This impressive structure boasts of pristine white marble flooring and has beautifully gilded altars decorated with frescoes and inlay work. 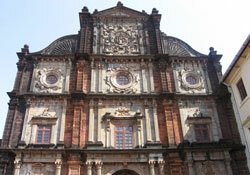 The imposing façade is endowed with a profusion of basalt embellishments making it one of the richest facades in Goa. The Basilica of Bom Jesus enshrines the sacred remains of St. Francis Xavier, a member of the Society of Jesus (Jesuits) who died on a sea voyage to China in 1552. Legend has it that when the body of Xavier was transferred to Goa the following year, the body was found as fresh as the day it was buried. Consequent to this miracle the title of 'Saint' was conferred on Xavier and his mortal remains, confined inside his tomb, attracts devotees from all over the world. The mausoleum of St. Xavier was carved by the 17th century Florentine sculptor Giovanni Battista Foggini and the saint's body is kept in a silver casket. On the auspicious occasion of 'Exposition,' the silver casket is lowered for pilgrims to view the St. Francis Xavier's body. The exposition of St. Francis Xavier is held once in every ten years, the last being in 2004.